The team finds themselves headed to the Salem witch trials when the magical Time Seismograph goes off. Meanwhile, Nate and Ava work together to try to keep their Time Bureau funding. I know Nate is not popular on the Purple, but I really like him and I hope he's joining the Time Bureau so they can have more storylines that include Ava. I'll be sad if he's written out of the show. I really felt for Zari this episode. Great performance. The linked review says more than I ever could. John Constantine: now filling the "morally ambiguous" slot vacated by Rory. I was not a huge fan of Matt Ryan at first - he didn't quite match the Constantine in my head - but I'm very happy with him now. And I do enjoy his and Rory's fight for dominance, down to which "football" they're going to watch. God bless Brandon Routh for just going for it and doing some of the goofiest stuff on the show, including getting naked. He's an (inter)national treasure. Nate started out annoying, but I put some of that down to carry-over season 1 badness. I still wouldn't put him at the top of the list of my favorite Legends, but, he's become perfectly good with all the buddy comedy stuff they give him, especially the Nate+Ray combo. I adore Legends' Ray and his boundless positivity, such an improvement over his Arrow creeper origin. This season continues to knock it outta the park. I about died at the fairy godmother, and I really felt for Zari. Also, the 'proof magic is real' scene was awesome even knowing exactly how it would go down. Hell, I even like Nate now - giving him a non-romantic interpersonal issue was just what he needed. A++ would travel back in time to watch this again. Man Tala Ashe really knocked it out of the park. I really felt that performance. And the fact that it's so timely really helps. And then you get naked Ray because he was a pig! And then Nate had to go Commander Steel to be strong enough to hold him up. That was a delight. The biggest disappointment is that they cut out the scene in my head of Mick turning back into a human, naked, on all fours, with chips in his mouth, grunts a "hmph", and then grab some more chips with his hands and then walk back to his clothes without a care in the world. It makes sense, but I wish the Godmother wasn't sent to hell and would've agreed to help Constantine. I want more singing down the line! Also, reality manipulation is like one of the strongest powers there is, I don't see why the Godmother would be afraid to team up with Constantine, but I suppose it remains to be seen what is actually going after "Johnny". I didn't mind Nate, so I hope he's just getting a teamup with Ava and not actually getting less screen time. But Jes Macallan is a series regular now, so that probably means we're still going to see more of her and Nate. This episode was pure genius. That first fairy godmother scene had me in stitches. This show definitely needs more singing (and dancing). It also apparently needs really sharp and competent IP lawyers, because, boy did it walk right up to that Disney copyright line on multiple occasions and point a toe over the edge. I was never Nate's biggest fan, but this seems like a good way to keep him around and keep the special effects costs down. I can't imagine the Steel treatment is cheap, so if the can include more Nate without putting him in a position where it would be obvious that he'd trot out his powers, that should work for the greater (economic) good of the show. Then, when he and his abilities are truly needed, they can write in an episode where he's back on board the Waverider. I too was kind of hoping that they'd pair the fairy godmother up with John, but realistically, that wouldn't happen. For plot reasons, they need to isolate him and keep him without magic allies for as long as possible. Now it's been a while since his solo show was on the air and since he was introduced into the Arrowverse, but didn't he specify at some point along the way that he wasn't Constanteen but Constantyne? I could have sworn there was a scene with Matt giving pronunciation lessons for John's last name. It's nice to see Ava with a story that doesn't involve Sara. Maybe we'll get more of that (along with more Gary) now that Nate's going to hang out at the Time Bureau for a bit. John and Mick should make for an interesting dynamic. I don't know that it will replace the buddy dynamics that have come and gone before, but it should be fun to watch for a bit. I do wonder what they're going to do with Ray now that Nate's not going to be available to pal around with--will they be going down that Ray and Zari route that seems to be building, and if so, will it evolve into something more than friendship (such as a potential love triangle with Nora)? I hope that's not the case, but I'm willing to give the writers a bit of trust this season to not totally blow up all of the positive character development they've done over the past little while. I hope we get some c-story stuff with Nate and Gary trying to bro up, but they just don't mesh. And then Ava notices Gary is kind of down and asks why, and Gary tells her that Nate won't leave him alone and his clingy ebullience is getting annoying. Did they ever explain why the time bureau is based in 2018? Seems like it would be based far in the future when time travel is more of a thing. Isn't Constantine kinda a much bigger fish in the DC Universe than the rest of these folks, who were recruited in the first season specifically because they were has-beens and never-will-be's? I'm not a comics guy but I was under the impression that he was a bit of a heavy hitter mystic-wise. Or at least lore-wise? Or do I just have that impression because they made a Constantine movie? Historically, I think the Atom (the comics version, not whatever version Brandon Routh is playing because even though I've come to enjoy it, it's not the traditional Ray Palmer from the funny pages--honestly, most of the time when I'm watching this show, I forget he's supposed to be the Atom/Ray Palmer) was the best known of the original group. Hawkman was about his equivalent in status. Both were Silver Age creations who got their start in the early 1960s and were key members of the Justice League. They weren't quite part of the original seven (Batman, Superman, Wonder Woman, Flash, Green Lantern, Aquaman and Martian Manhunter), but they were added once the team got its own title. Constantine was created in the 1980s in a niche corner of the DC universe known as the Vertigo imprint*, which was supposed to be for "mature readers" (although that never really stopped any kids younger than 18 from reading the titles). He had a lot less interaction with mainstream DC heroes (Superman, Wonder Woman, etc.) than the Atom or Hawkman, but within the "dark" or mystical/magical corners of the DC Universe, he became a pretty big deal. I think (and I could be very wrong here) at one point after DC mucked about with title relaunches and renumbering and starting historical characters over at issue one again and again, Hellblazer (Constantine's title) was the longest continually running and continually numbered book DC was printing. I'm pretty sure there have been more issues starring Constantine than there ever were issues starring the Atom or Hawkman. So the question about who is a bigger fish is one of perspective. If you ask older, readers more familiar with DC's historical characters, they'd say the Atom or Hawkman. If you ask younger readers, they'd say Constantine. *If we're going to get technical, Constantine first appeared in the pages of Swamp Thing which wasn't a Vertigo title because that didn't exist at the time, but his character kind of became a launching point for the creation of Vertigo and his own title was published under the Vertigo imprint. Thanks for the nerdsplosion, that is a good primer. LOL! It is a bit of an overreaching nerdsplosion, isn't it? Sorry, but also not sorry. It's nice to share all this useless trivia I've got stuck in the far-reaching corners of my head. It's also a good reminder for me that when I'm commenting on these shows to remember that not everybody has a history of growing up with these characters and knowing their histories dating back decades. Sounds like you're the person to ask about DC heroes though. Soooo... it sure looks to me like J'onn on Supergirl is clearly more powerful than the Supers are? He's got almost all the same powers but can shapeshift, is telepathic, and isn't vulnerable to Kryptonite? Is there any sense in which they have a leg up on him? Not having a breath weapon or heat ray eyes doesn't seem like nearly a balance for the other stuff. His vulnerability to fire is probably more of a weakness than vulnerability to Kryptonite is, given how common fire is and how rare (relatively speaking) Kryptonite is. That said, I think his telepathic and shapeshifting capabilities more than make up for lack of heat vision, super breath, etc. There's a reason he's been one of the main JLAers since its inception. The one thing Supers bring is that happy, breezy, hopeful, friendly countenance to the face of the League. J'onn has always been more reserved, more akin to Batman's personality than Kara's or Kal's. Just a small nitpick of sardonyx' DC history, in that there were Golden Age versions of both Hawkman (first appearance in 1940, in Flash Comics #1) and The Atom (first appearance also in 1940, in All-American Comics #19). The Golden Age Hawkman was fairly similar to the Silver Age version, but the first Atom was basically just a guy who was physically small in stature but a tough fighter; no super powers at all. As sardonyx points out, this version of the Atom is unlike either the Golden or Silver Age versions; he's considerably more powerful than either. Too bad the show's budget only allows for occasional appearances of the Atom suit in action. Very true. I neglected the Golden Age stuff, when I shouldn't have. My bad, especially when Legends has been known to dip into the JSA pool. No apology needed, sardonyx - the existence of Golden Age versions of those characters doesn't really contradict any of the points you made. I'm still kind of pissed at how badly "Legends" screwed up with Hawkman and Hawkgirl, who had/have the potential to be cool live-action characters. And since you've mentioned the JSA, I wish they'd kept more of the JSA characters around for more than a 1- or 2-episode cameo. I would have liked to have seen more of, say, Hourman or Doctor Mid-Nite going on some missions with the Legends. Lastly, am I the only one that thinks that the team right now seem a bit under-powered or short-staffed? Especially with Nate now being part of the Time Bureau instead of the Waverider crew, seems like they could use another member or two. You're absolutely right about how badly Legends (and Flash) treated the Hawks. At first I was happy that we were getting these characters, because they looked really, really good--like way better than I would have ever expected to see them portrayed in a live action property. I don't think the actors did a very good job with the terrible material they were given, but I thought they actually looked the part. The actor playing Katar especially was great from a resemblance/physical point of view. Even though the actress playing Shayera departed from the green-eyed red-head mould, she also looked right for the role. It was everything else that ruined the characters. I'm also with you in that I was hoping for more of the JSAers. I think they wasted a lot of potential and a lot of interesting characters by burning through them so quickly. I can see the team being a bit low on power now, but let's face it, power isn't cheap. Special effects cost money, hence limiting the action for Firestorm, Steel, and Atom. Constantine is cheap (handwaving with a bit of light effects). Zari is also relatively cheap with people physically reacting to the stone's power. Sara is nothing but some physical stunts, so not too much cost there. Mick's fire effects aren't likely to be too expensive to produce (and even then, they're pretty limited). This is all about budget. Can you imagine this show with double or triple the budget? It would rival the Avengers for impact. Okay, that's an exaggeration, but this production team seems to do a really good job of stretching what money it has and getting the most for it. It would be fun to see a season where working with much looser restraints. Yes, it would be fun to see what they could do with a bigger budget. The Berlantiverse producers got a good bang for the buck in last year's four-way crossover of the various DC CW series, which I found to be just as entertaining, if not more so, than many/most big-budget superhero movies. I wonder how expensive it is to render the Citizen Steel effect, given that it's basically the same "liquid metal" thing first seen in Terminator 2 in the early 90s? After all this time, you'd think something like that would be available as whatever the equivalent is for video of a Photoshop plug-in. What I'd like to see is for "Legends" to add another character or two, drawn from somewhere in the DC universe, and it'd be good if there were at least one additional person of color in the permanent cast, too. Maybe use some obscure character like Cave Carson - you could make him over into kind of an Indiana Jones-type who's both smart and good with his fists, and cast a black, Latino, or Asian actor in the part. No need for any expensive special effects there. Wow, that's the deepest dive into the DC back catalogue that I've ever read here on. He would definitely be a workable addition to the team. Plus it would give Nate (when he's back on the ship) a history buddy to bounce facts off of and squabble with about historical interpretation. Now that they've added John, they've covered off on magic. Sara provides the fighting force. Ray the scientific knowledge. Mick is good on the B&E and various less-than-lawful skills. Nate can still chime in on historical knowledge. Zari has some elemental power. Yes, they're a bit low on (cheap to render) brute force, but I think the biggest gap in the team is somebody to act as their detective and strategist, so maybe somebody like Captain Compass would work. I'm not suggesting him for regular status, but I also wouldn't object if the team bumped into Nathaniel Dusk in their travels and had a film noir type adventure in the 1930s. Talk about deep dives! Captain Compass was new to me, but reading the very short Wikipedia entry on the character, I agree that he could work in "Legends" (if written and cast properly, but then that's true of any potential addition to the team). I'm sure there are other lesser-known DC characters that could work, too, given that there's nearly 80 years worth of material to mine. The "Legends" team definitely does have a void in terms of personality types - they could use a character who is less impulsive and more calculating/thoughtful than the rest of the team. Sarah doesn't really have a second-in-command, either, and you'd probably want that person to be the sort who keeps a level head while the others want to go off half-cocked. That could provide some nice conflict-grist for the story-mill. 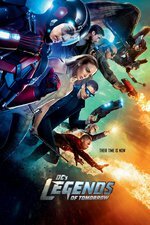 There are tons of lesser-known characters that could work, and if there is a show that can make them relevant to a modern audience, it's Legends. I picked Captain Compass pretty much at random. I was just looking for a detective-type character, and one of the great things about the DC universe is that it's got a detective for every scenario: TV detective (Roy Raymond), occult detective (Dr. Thirteen), ship detective (Captain Compass), simian detective (Detective Chimp), typical hard-boiled gumshoe detective (Slam Bradley), more modern PI detective (Jason Bard, who given his physical disability, might make for an interesting addition to the team and add a different type of representation to the mix), stretchy, mystery-sniffing detective (Elongated Man), etc. I'm pretty sure there's a pilot detective too, but the character's name is escaping me at the moment. But as you said, so far this season the Legends production team has been dead-bang on delivering the goods, so I'm happy to be along for the ride. MeFi Nerds are the Best Nerds! Oh, and would add that I thought the animated "Justice League Dark" video was really good. I think it's essential to the genre. Produced by Dwayne McDuffie and Bruce Timm, it's got that classic Kevin Conroy Batman, and perhaps the best voice casting/dialog work I've ever seen. After that they had better give us some time travel back to John's Mucous Membrane days.